Towering above the town is a pointed cliff forming the summit of that wall of precipice which rises straight out of the sea. 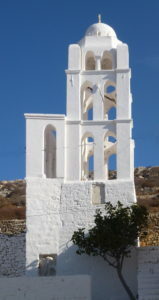 On the summit of this cliff is perched the remains of a castle, which once belonged to the dukes of Naxos, and all that is left of the old Hellenic town. This is 1,160 feet above the sea, but what one chiefly sees now are Roman remains, cisterns, and walls. 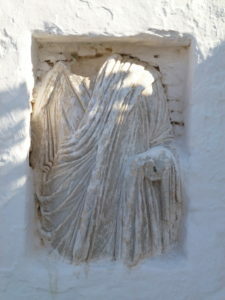 Into the bell tower of a large church half-way up the hill, dedicated to the Assumption of the Virgin, is let the torso of a Roman figure, and in the church itself there are traces of old pillars . . . This is Theodore writing of ‘Pholygandros’ in the Cyclades in the winter of 1883/4. Who knows if that ‘torso of a Roman figure’ still remains? And what of the other thousands of references he makes to things the couple saw during their circumambulation? Are you perhaps interested in the Bents and living on a Cycladic island? If so, would you like to think of becoming a Bent field-agent? Turn yourself into an expert on Theodore and Mabel’s time on your island (all those referenced personalities, antiquities, sites, sights, customs, costumes, food and drink, footpaths, flora and fauna, etc.) and provide valuable updated information for researchers on this site! For information and details of the Bents’ visit/s to your Cycladic island, and how you might like to become a Bent field-agent, contact us at info@tambent.com.